Glaucoma is often called the sneaky thief of sight. This is because there are no symptoms associated with glaucoma. This prevents people from knowing they are being affected unless they have an annual eye examination. 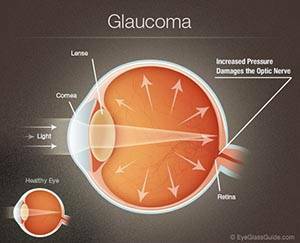 Glaucoma comes in several forms, however; the overall condition is an elevation of intraocular pressure. This elevated pressure while painless can have devastating effects on the optic nerve. It deprives the nerve of blood flow which leads to a progressive degeneration and eventual loss of sight if left untreated. Thankfully the treatment for glaucoma is usually simple. Eye drops can be prescribed and taken once or twice a day in order to lower the pressure and preserve the health of the optic nerve. While surgery may be needed for more aggressive forms of glaucoma this is usually not the case. Given the lack of symptoms with glaucoma we always recommend an annual eye exam for patients over the age of Forty. Schedule an appointment today with Dr. Gentile, Dr. Buccellato or Dr. Giangrande for a consultation about glaucoma.